I'm trying to free your mind. But I can only show you the door. You're the one that has to walk through it. It’s very simple really. 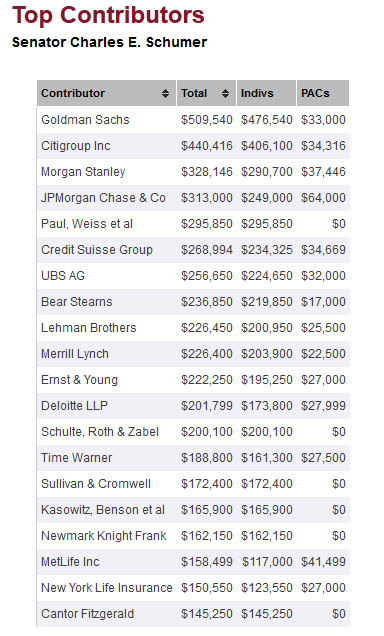 Please point out where on the below list of Top 20 contributors to a randomly selected US politician, in this case New York’s Chuck Schumer, can one find Standard Chartered, Barclays, or HSBC? Previously we showed that when it comes to Wall Street’s returns, the 8% market return benchmark that every first year analyst finds in Ibbotson’s is for naive amateurs. With corporate lobbying returning anywhere between 5,900% and 77,500%, the real money is to be made in the buying and selling of politicians. Yet in our day and age, when information propagates rapidly and when political muppets can be exposed for the Wall Street purchased frauds they are, lobbying is getting increasingly more complicated. Which leaves one other high returning “investment“, which unlike lobbying is completely riskless when one is a Wall Street firm: crime. But not just any crime, the type of crime where a firm settles “without admitting or denying guilt” and in the process is slapped with a fine that barely covers the government’s legal fees. Case in point: U.S. v. Morgan Stanley, U.S. District Court, Southern District of New York Case#11-6875, where MS was punished with the epic disgorgement penalty of $4.8 million. Of course, the fact that Morgan Stanley, who did not admit wrongdoing, generated profits of$21.6 million, is merely a triviality. But a useful one: it allows to calculate that on Wall Street crime does pay, and the IRR is in give or take 350%. “In fact, the inflation may even be fostered by the Fed. Brent crude is trading over $112 again, and gas at the pump is already rising. Bernanke today, I’m quoting a headline, ‘Bernanke says economic data may mask suffering of individuals.’ I agree with that, but I’m still surprised to hear a Fed Chairman saying that. Another individual on the Fed Open Market Committee said, ‘Open-ended easing is needed for jobs.’ This is the type of commentary we are seeing, even with commodity prices starting to rise…. Capital Account – GATA’s Chris Powell on the Silver Manipulation Probe & the Fed Gold Audit! Welcome to Capital Account. JP Morgan said in a court filing that PFG’s subpoena of the bank may be overly burdensome. Will JP Morgan find a way to get out of it? It looks like they could be off the hook for accusations of silver manipulation. The Financial Times reported US regulators are increasingly likely to drop the four year investigation of silver manipulation, failing to find enough evidence. Bart Chilton, CFTC Commissioner, told a Motley Fool reporter that this FT report is premature and inaccurate. We find out what Chris Powell, co-founder and treasurer of the Gold Anti- Trust Action Committee, thinks. Since 1998 the Gold Anti-Trust Action Committee, GATA, has been exposing, opposing, and litigating against collusion meant to control the price and supply of gold and other precious metals. GATA has collected and published dozens of documents showing Western treasury and central bank efforts at intervention in metals markets – interventions that occur both openly, as well as surreptitiously, preventing the proper functioning of a free market in gold. Chris Powell, co–founder and treasurer of GATA and Managing Editor of the Journal Inquirer, has come all the way to our DC studio to give us an update on where GATA is in its efforts. 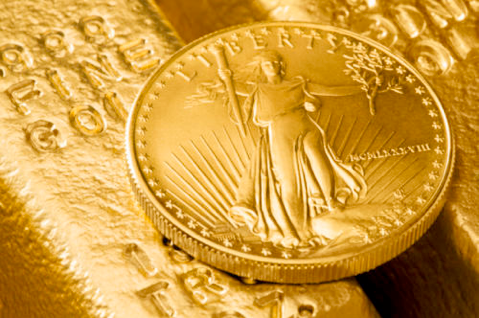 Also, the Federal Government is auditing the gold stored at the New York Fed. Are those who have been calling for an audit for years satisfied, or does this miss the point? We talk to Chris Powell about what this audit accomplishes, and if it even begins to scratch the surface, no pun intended. “There does have to be the realization that the hope of an economic recovery in the Western world will end up being a delusion. 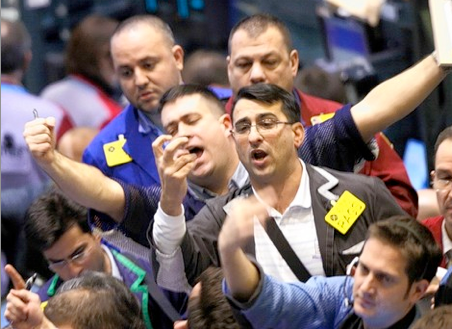 Investors and authorities who believe there will be a recovery are deluding themselves. But hey, hope springs eternal. There is the continued stimulus being provided by the Federal Reserve, and of course some of that newly printed money ends up in the equity markets…. In this episode, Max Keiser and Stacy Herbert discuss jihadi bots gone wild while the President of the United States was pumping and dumping Facebook stock. Max and Stacy also discuss what the first ever Predator droned American may mean to Goldman Sachs’ bottom line as the banks begins collateralizing crime and recidivism. In the second half of the show, Max Keiser interviews burning banks artist Alex Schaefer about his recent arrest for chalking the words, ‘crooks,’ ‘crime’ and ‘chaos’ in front of a Chase Bank in Downtown Los Angeles. The eight hours in jail means that the artist Alex Schaefer has done more time than any bankster since the financial crisis began.